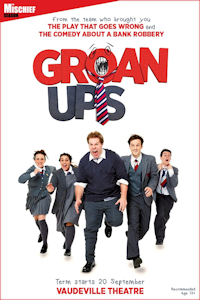 Groan Ups tickets at Vaudeville Theatre, London. 2019. Find the best Groan Ups play tickets at Vaudeville Theatre, West End. From the parents of The Play That Goes Wrong comes a brand-new comedy all about growing up. Are we the same people at 30 as we were at 13? Does school life determine our future? Do we ever grow out of our school crush? Playing an unruly classroom of kids and anarchic high school teenagers, through to the aches and pains of adulthood, the original Mischief company are back in the West End with their first new play since 2016. Performers Dave Hearn, Henry Lewis, Charlie Russell, Jonathan Sayer, Henry Shields, Nancy Zamit, Bryony Corrigan. Author Henry Lewis. Author Jonathan Sayer. Author Henry Shields. Producer Kenny Wax Ltd. Producer Stage Presence Ltd. Company Mischief Theatre. Director Kirsty Patrick Ward. Friday, 20th September 2019 to Sunday, 1st December 2019. Open 10th Oct 19. Groan Ups tickets: The tabs above allow you to select between links to suppliers and date searching. Click on a supplier's logo to see their details and on the 'buy now' button to see and check the tickets on offer.